Channel sound, frame refresh rate, aspect ratios… if you have to learn these terms to set up your home theater system, you are missing out on all the excitement and entertainment of HD movies and shows. Home theaters are all about fun. Our expert home theater installation services let you get straight to enjoying your movies and music. Our team can provide wall decor, game tables, theater seating and much more. 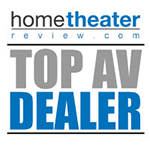 If your current home theater has not achieved its full potential, contact the audio/video experts at HTIH. Our experts can offer you the best home theater seating including recliners, sectionals and sofas, and seating accessories. We can create raised seating platforms right inside your home. Experience the best of comfort, color, and quality come together in your home theater. We have a broad selection of theater lights, movie posters and frames, neon signs, game room décor, game tables and chairs, stationary sofas, and boom chairs. Setting up an audio and sound system outdoors requires systematic planning. Background noise, weather, location, and purpose of these systems affect installation and accessories. HD screens, 3D projectors, and swivel mounts require careful planning and measurements. We can setup your LED TV outdoors to enliven your barbecue or poolside party. Our professionals perform a variety of sound installation services and are experts with 5.1, 7.1, and 9.1 speaker systems. We also provide speaker mounts, multi-room audio systems, and bass shaker systems. We like making things simple. Our services are not limited to audio & video. We can also help automate your home completely. In your smart home, you can control your audio and video systems, lights, seating, and music with the push of a button. We will help you create customized settings for different occasions. Press a button to switch from bright lighting you can work in, cozy date night lighting and music, to party sound and lighting. We provide many choices for wall-mounted control panels and wireless activation devices. Contact us to get a free consultation. We will recommend the best layout and offer an estimate of the cost. We will also suggest the hardware that you should purchase before the installation.